It was another green arrow for Mr Crowd Wisdom last week, with 8 correct predictions beating the community average of 6.11 out of 11. These included 1 Exact score (Burnley 1-1 Southampton), and 6 Close picks. 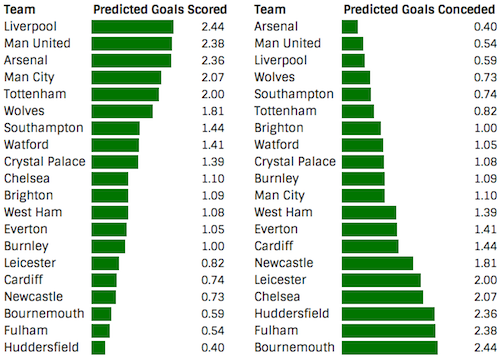 Liverpool sit top of the Predicted Goals chart this weekend, with a kind home tie against Bournemouth, and it’s no surprise to see Mo Salah as the clear favourite in the Captain Poll. Man United and Arsenal are not far behind them though, which could bring Paul Pogba, Marcus Rashford, and Pierre-Emerick Aubameyang into contention. Arsenal are predicted to keep a clean sheet, with Man United and Liverpool also expected to be tight at the back. Wolves, Southampton and Brighton appear to offer the best budget options at the back this week. I hate having two FT and not wanting to make a transfer. Just done Firmino (My only real differential from the template) to Rondon to save funds. Awaiting Firmino hatty now. Yeah think that Firmino move could have waited till next week. Could bang this week. I've always thought wisdom of the crowd was a underused concept from when I used to run the Guess The No. Of Xs In The Jar stall at my local Sale Of Work (Sale Of Work is Irish equivalent of a fête) where X has been sweets, crayons and corks and the actual answer has always been within 3 of either the mean or the median of the guesses. However I don't think it's as accurate for sports predictions as people will just be biased towards the favourite and while going with the favourites, odds wise, will put you in a good position in predictor competitions, I find the winner will always be someone who did a few longshot predictions along the way. I don't think you're wrong here, but I do think this approach has its place (just not as a standalone system). Certain popular teams' odds get inflated by the Bookies too, and I wouldn't want to rely solely on them either. But the true 'Wisdom of the Crowd' approach, as championed by Nate Silver in 'The Signal and the Noise', would see us aggregate the predictions of several different systems to obtain a set that is (hopefully) better than any one contributing system. I think this approach shows real promise, and this article could be a key ingredient. And another thing it does is tell you what your average opponent expects the outcomes to be; which could be helpful if you want to 'know your enemy'. Hi guys, Im finding myself in a strange position this week in that I’m relativity happy with my team and I’ve got 2 transfers. I’m pondering whether I should move on Sterling before his blank or replace Richardson (annoyingly I’m 0.1 out from being able to do a straight swap to Son). I'm in the same position with 0.5 INB (see below). Will probably update a bench player, looking ahead to GW27/28. Man C players are so risky - that could bite you either way. You could downgrade Sterling for a player with better fixtures and get Son in for Richarlison. His form and fixtures aren't great but I love a striker against his former club so I would be tempted to hold. Surely Son is a better option though. 2FT. Will use 0 or 1 transfers. £0.5m INB. Thanks so much but this was post for last GW. Appreciate the advice on McNeil, I think I will keep him until WC/FH. Puncheon is worth noting too, thanks for the tip. Martial did well in the end!